Article 23 states: “Everyone has the right to work, to free choice of employment, to just and favourable conditions of work and to protection against unemployment.” The article also adds that “everyone, without any discrimination, has the right to equal pay for equal work”. 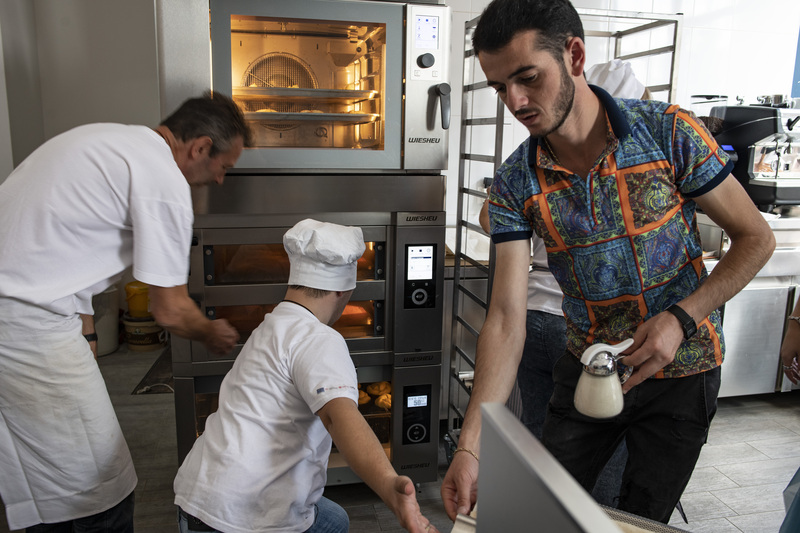 We went to Gyumri to meet people that now work in the first inclusive, barrier-free bakery and coffee shop in Armenia, which employs people with disabilities, thereby providing employment opportunities for this vulnerable group of people. 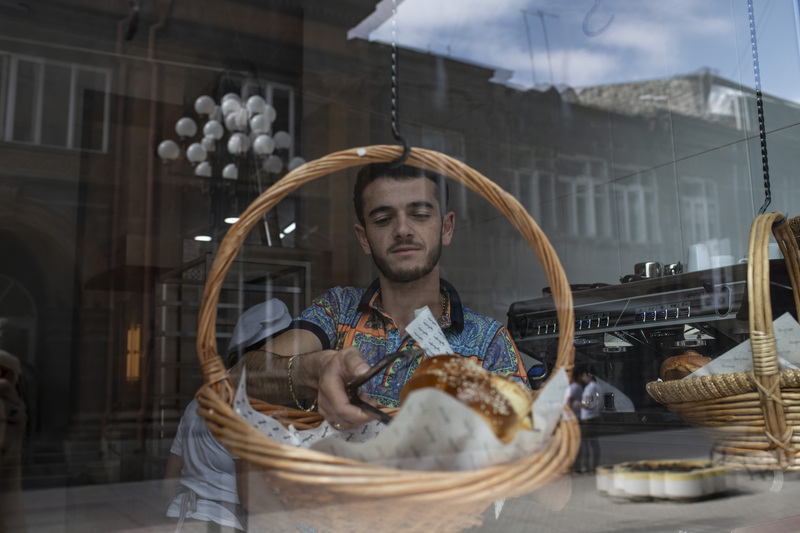 21-year-old Grisha Khachatryan works at the first inclusive bakery and café in Gyumri. Grisha, who is disabled, started working there in October of this year, and this is his first job. He says that he looked for work before this, but it is practically impossible for a disabled person to find a job in Gyumri, which has a very high unemployment rate. Grisha studies at the 4th Gyumri College. He goes to work after class, at around lunchtime, and gets home around six in the evening. 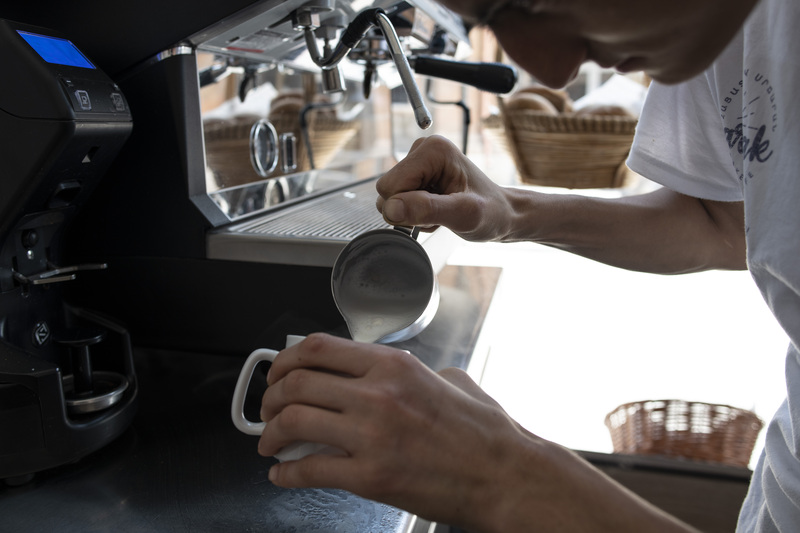 Grisha's work is not complicated; he makes coffee and serves it to customers. I asked him how his daily work was going. “[It’s] good. I turn on the coffee machine and make coffee,” he replies, without sharing too much. Only later does he start listing the kinds of coffees that he makes: cappuccino, espresso, Americano… and, he says with a smile, even iced coffee. Customers are happy with the coffee made by Grisha. Grisha says that before, he could not find any work, even though he was looking for it persistently. He likes making coffee and the culinary arts. 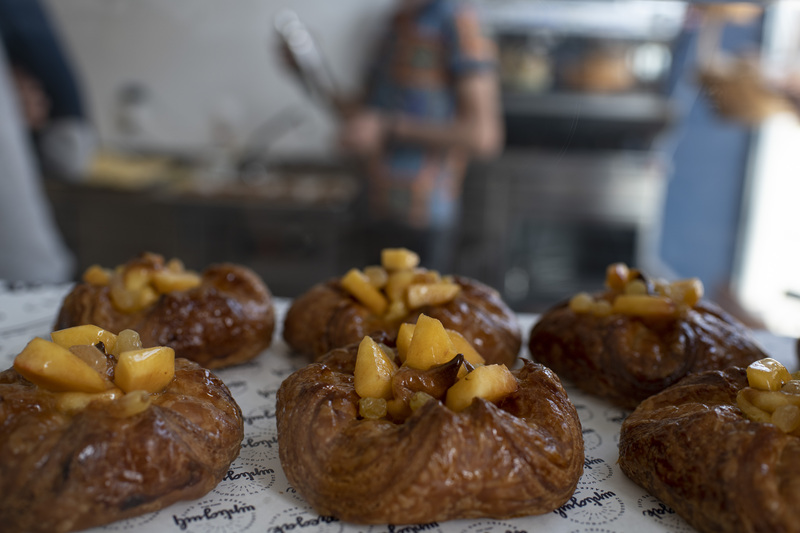 “Once, I noticed that the ladies [working in the kitchen] took Grisha to the kitchen and he was kneading dough for croissants, and I felt how much pleasure he took in making them,” says Hakobyan. “It was sad to see this, because he makes great coffee and there is nobody to replace him with at the moment!" 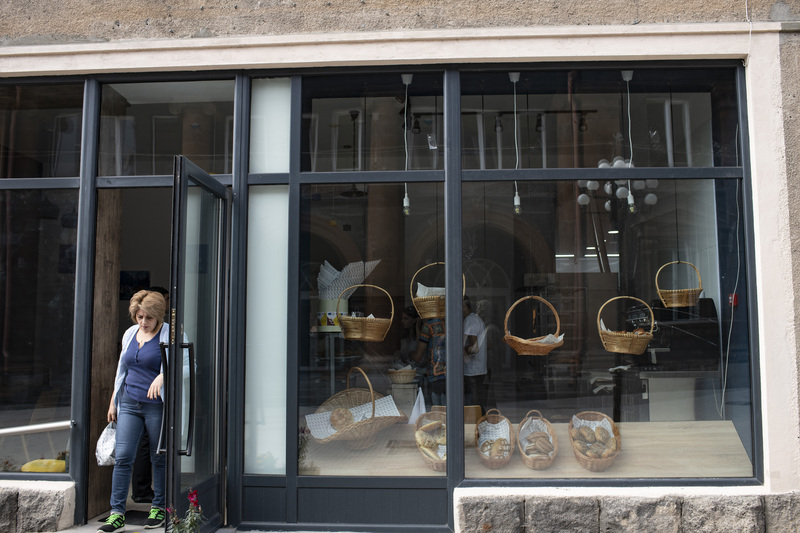 When it opened in September of this year, this was the first such “inclusive” bakery and café opened in the Gyumri region. It’s called Aregak, which means “sun” in Armenian. The business generally hires people with special needs and parents of children with disabilities. 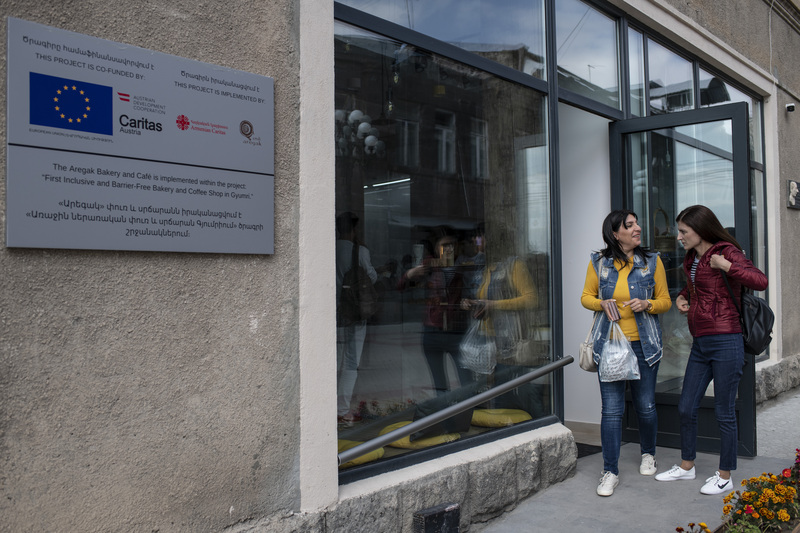 The project, which became possible due to the support of the European Union, the Austrian Development Agency and co-financing by Caritas Austria, was welcomed in Gyumri with great enthusiasm. In just a couple of months, the inclusive café became very popular and always had plenty of customers. Akopyan explained to us the story of the creation of the bakery and café. The Caritas-Armenia organisation has been implementing the “Emili Aregak” project since 2008. The goal of the project is to take care of children with special needs. However, at some point, in addition to providing care, the need arose to find work for children who were turning into teenagers and young adults. “In 2016, the EU announced its support for NGOs. We got together and discussed how the Emili Aregak project could benefit from it. We decided to create a space in Gyumri, which would allow people with special needs to show their potential. 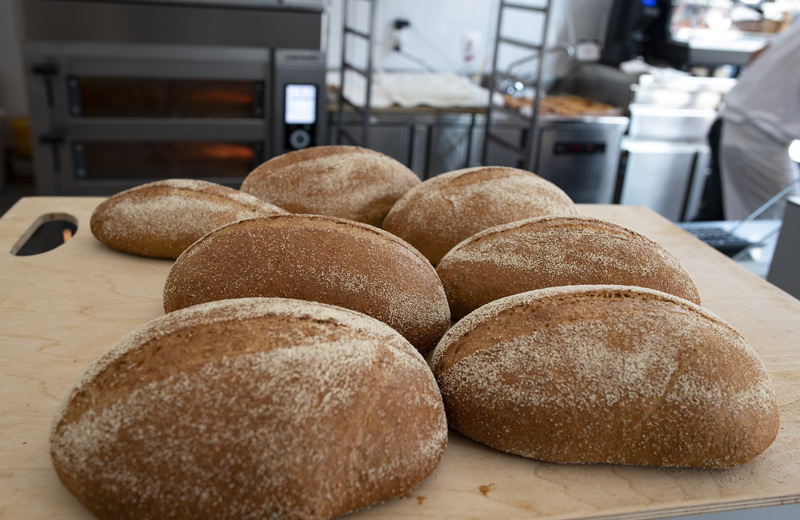 We decided to open a bakery where everyone could see that bread could be made in hygienic conditions in Gyumri, all thanks to our employees. 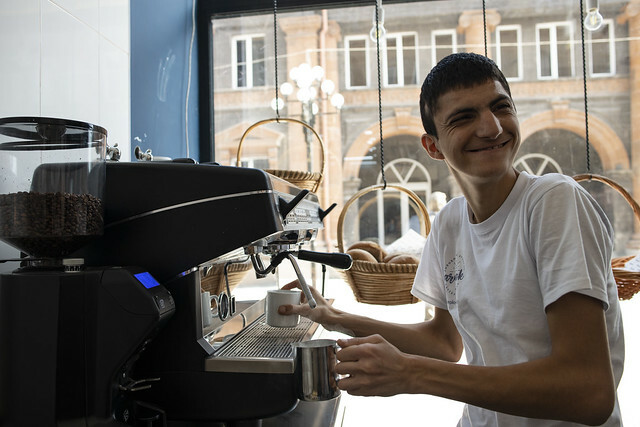 The second goal was to open a coffee shop where works created by people with special needs could be displayed,” says Hakobyan. At the moment, there is an exhibition of works created by people with special needs at the café. 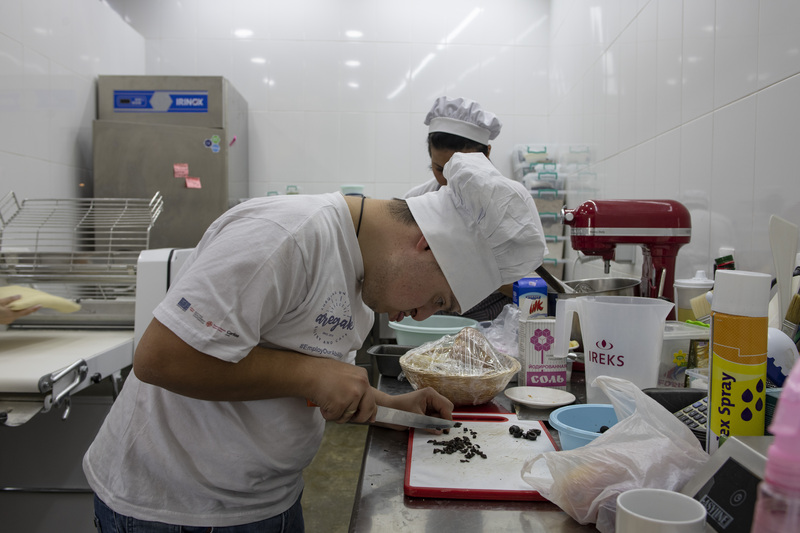 At present, four people with special needs are working for the inclusive bakery and café: Anush, Mikael, Hovhannes and Grisha. Another four members of staff will begin work in November. Hakobyan says that these people were hired not because they had special needs, but because they were simply given an opportunity to express themselves and work, because they want to do something useful. And they prove, every minute, that they have a right to work and be part of society. This problem is highly relevant in Armenia. People with special needs not only have a hard time getting a job, but also integrating with society in general. 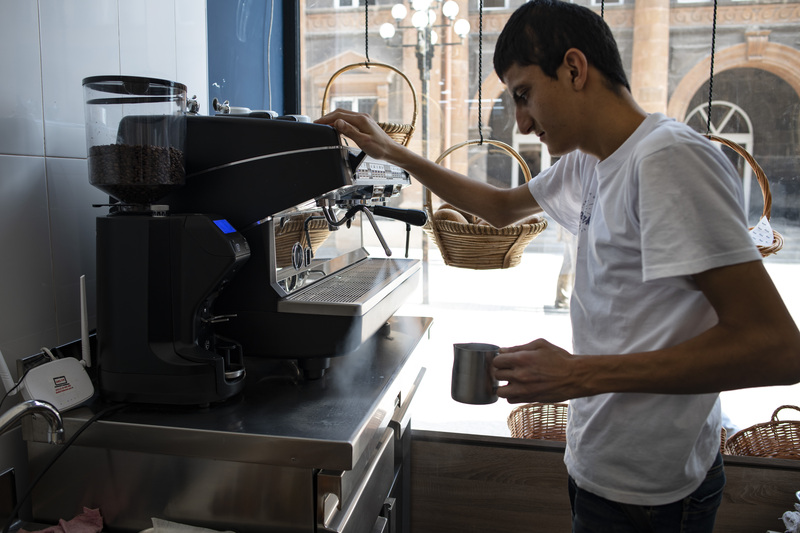 According to Hakobyan, the café has become a space where people with special needs feel protected and are not discriminated against, which is something they have experienced at school or in other establishments. 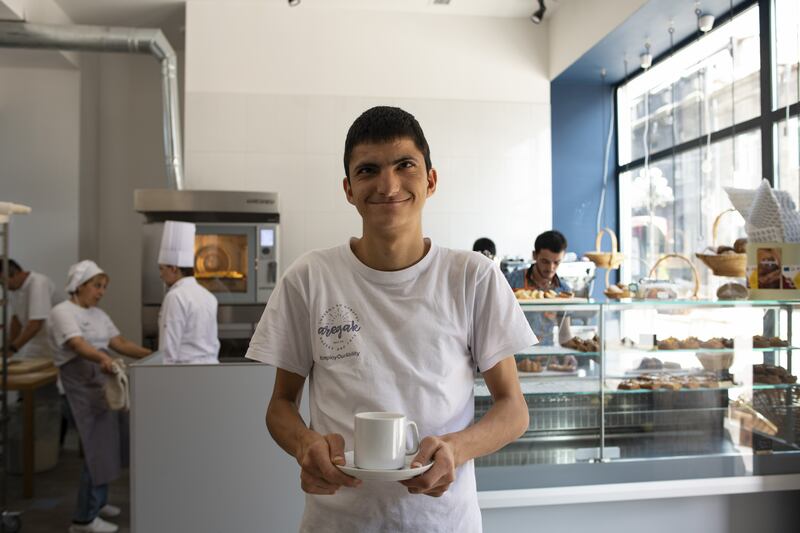 Mikael Saakyan is 20 years old; he works at the inclusive bakery and café as the assistant to the baker, Anahit Grkikyan. 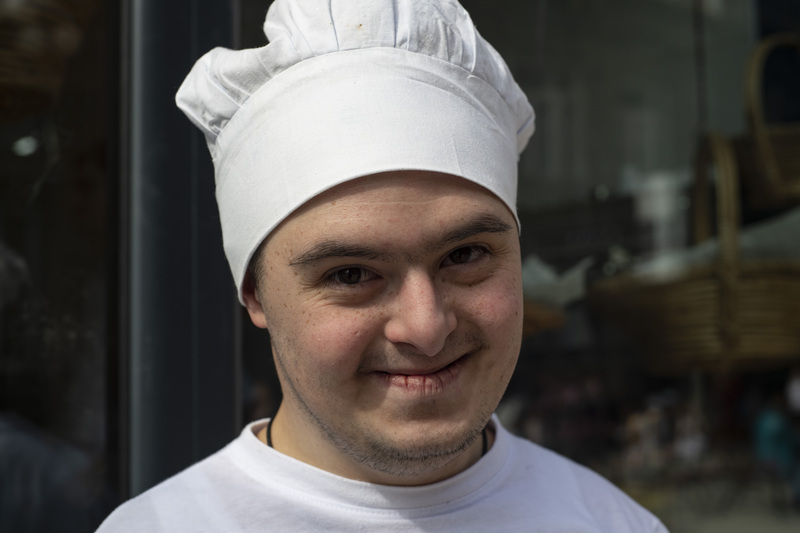 Baker Grkikyan was the inclusive bakery and café’s first employee. Her son, Edgar Kalabyan, is disabled. 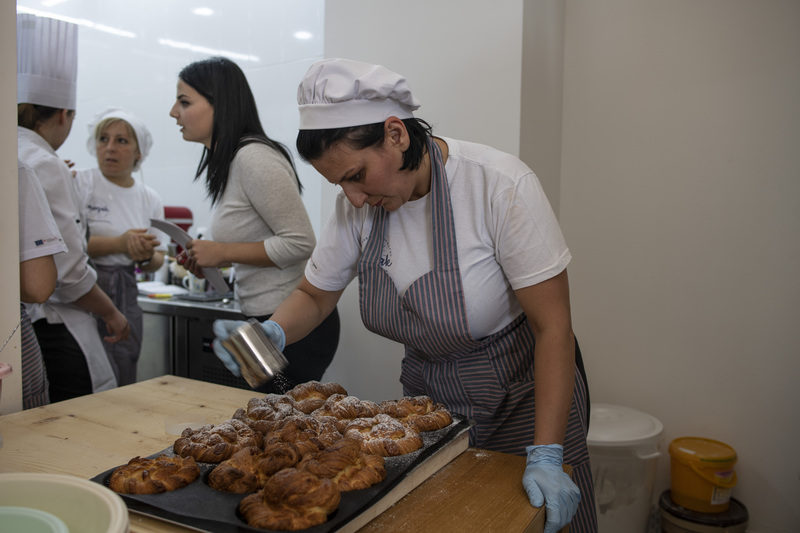 Grkikyan says that she did not work anywhere until she joined the bakery and café and had not even thought about looking for a job because she had to look after her child. “This is a new opportunity for me. I have known everyone for a long time, so the environment is almost family-like; there are close and understanding people next to me, so it is easy to work here. 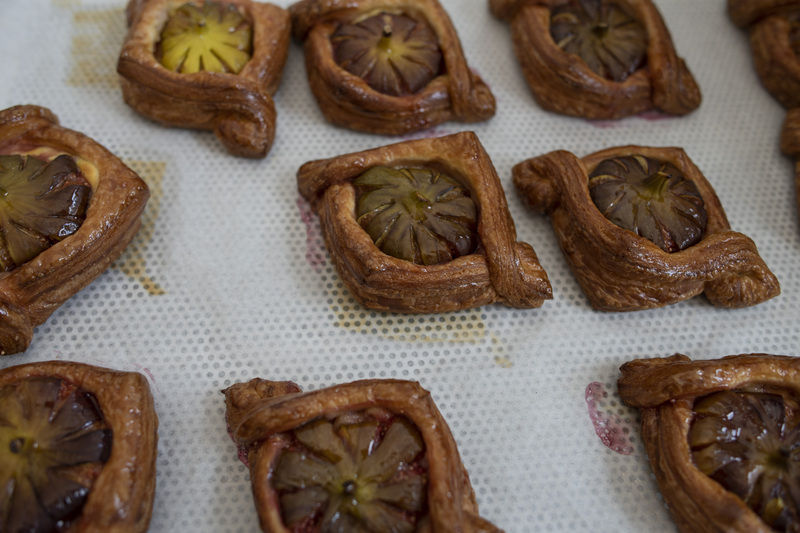 Before this I used to bake at home, and I asked them to hire me if there was a chance, and they did,” shares Grkikyan. 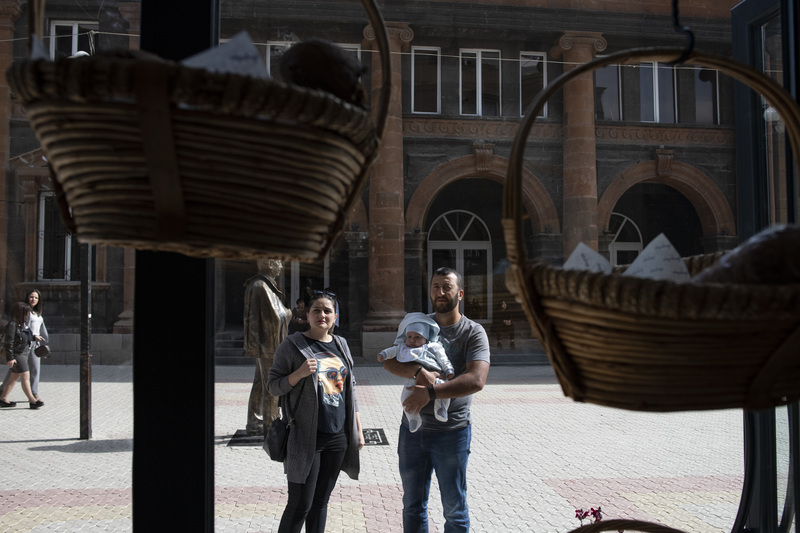 She says that not just one, but several similar centres should be created in Gyumri, as the city’s high unemployment rate means people with special needs have an even harder time finding work than usual. The EU financed almost 70% of the project. 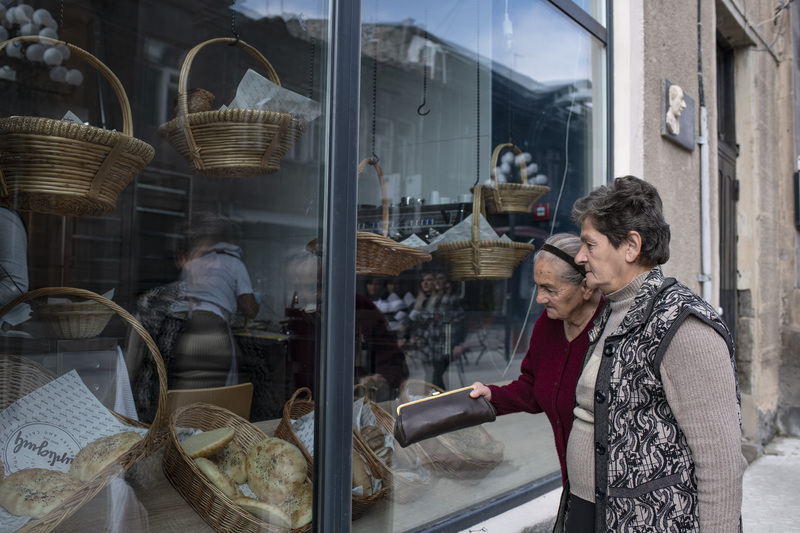 It includes not only the creation of the bakery and café, but also an exhibition of handmade goods, public relations, cooperation and farming. “The project consists of five major components. We view the cooperation component as extremely important, thanks to which Grisha and other young people came to Aregak centre and took part in a training course. People have already started coming to us and asking how they could help. We have become a source, an information centre for the city’s residents. We want to become exemplary employers,” reveals Hakobyan. “We asked the city to give us space so that we could show what we were able to do. We need to give people an opportunity to work and create,” she adds. In his opening speech during the opening of the inclusive bakery and café, the head of the EU Delegation to Armenia, Piotr Switalski, emphasised the importance of the initiative and its implementation and said that such projects promote the development of an inclusive society. The ambassador said that it was not about creating multiple jobs, but that such projects could have a domino effect and people in other cities could also start thinking about similar initiatives. Switalski added that the goal of social entrepreneurship is not to make money, but to unite the community. “We would like to see Gyumri as an example of an inclusive city,” the EU Ambassador to Armenia said. The deputy governor of Shirak Province, Sofya Hovsepyan, was one of the people behind the project. She says that it was an important mission and that each day, dozens of new guests visit the inclusive bakery and café. “The project can be assessed as exemplary, not only on the scale of the city and the region but also at national level. We need to change the way we think; inclusiveness should become a norm of life for us, the way of thinking and not just words. From this perspective, this project is the best example. The initiative attracts people to Gyumri from all over the world,” says Hovsepyan. She adds that customers have watched the young people work in awe and greatly appreciated the efforts of people who they previously perceived as not being able to work. “Now they show us, with their own example, that when a person really wants something, they can do anything,” she said. In December of 1988, a powerful earthquake took place in Armenia, taking the lives of 25,000 people. Gyumri was the epicentre of the earthquake and was almost completely destroyed. Many people became disabled as a result. For this reason, the EU project has a particularly special meaning here.